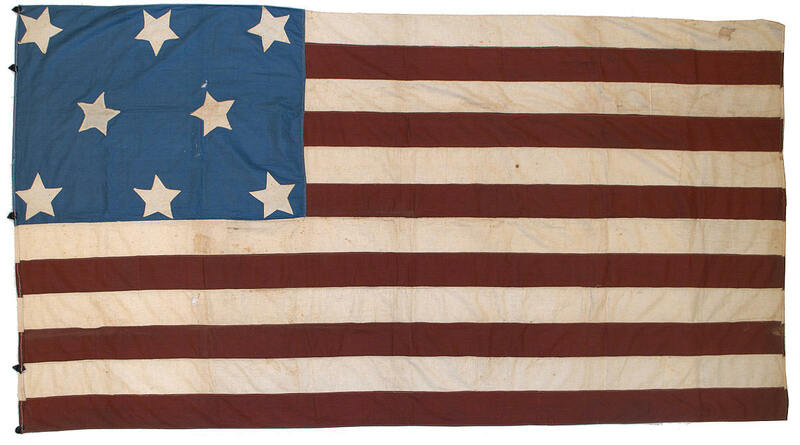 The reason for the unusual characteristics of this rare antique American flag are not completely certain, but the flag is a good example of how, by examining many attributes of a flag, we can make a reasonable explanation for why a flag appears as it does. This flag surfaced in recent times Florida, but its previous history is lost. One of the first things that comes to mind when finding an American flag with fewer than 13 stars or 13 stripes is that it is somehow associated with the Confederacy. In the early years of the Civil War, before the adoption of the First National Flag of the Confederacy, also known as the "Stars and Bars", a number of homemade flags were made in the southern states that resembled the American flag, but with stars and stripes representing the Confederacy. These prototype Confederate flags are extremely rare, and finding an example is of major importance. According to sources, "a contest organized in 1861 to select a design for a flag of the Confederacy included, according to the chairman's report, 'a mass of models or designs more or less copied from the United States flag. "1 Whether or not this flag was actually submitted to the contest of 1861, its form and format are evidence that it is in fact a Confederate prototype flag. The 8 stars of the flag represent Virginia, the 8th state to secede from the Union on April 17, 1861. During this time, it was unclear which states would eventually secede, though Maryland, a slave state and one of two "Border States" along with Delaware, was also strong candidate for secession, so an expectation of 12 states, as represented by the 12 stripes of this flag, would be reasonable. Arkansas seceded just 20 days after Virginia, which means it's likely this flag was made at either the end of April or beginning of May, 1861. The canton of the flag is a polished cotton chintz, a very fine fabric of high quality. The stripes are also of cotton, though not polished, and the red of the stripes is a deep burgundy red. A small group of Civil War era flags are known with very similar characteristics and coloring, including a 33 star flag also on a light blue polished cotton canton that also dates to the opening period of the war. Although the stars and stripes are treadle sewn in a fine stitch, many of the stripes are pieced together using vertical hand-sewn seams. Upon first inspection, I noticed five black tabs sewn to the hoist of the flag, which are made of what seems to be nylon, and appear much more modern than the rest of the flag. Also the hoist seems to have been folded back and sewn with newer thread than the rest of the flag, as part of the process of affixing the nylon tabs. This was probably done in the mid or late 20th century, perhaps in 1961 during the 100th anniversary of the Civil War. The tabs clearly were not intended for long-term use, and are certainly not original to the flag. Confederate flags are an important part of any collection of American flags. They were made by Americans in a time of great civil strife, and they represent a history and heritage that is part of the America we know today.